Not too long after arriving home from Spain, I tried my hand at making Fisherman’s Paella (Paella a la Marinera). Taste memory is a very powerful asset in the kitchen and I wanted to take full advantage of it while the flavors of Valencia were still fresh in my mind. I also wanted to use the saffron and rice that I picked up at the Mercado Central while they were at their absolute best. I turned to Saveur magazine, an authority on authentic recipes, to guide me through the homemade paella process. 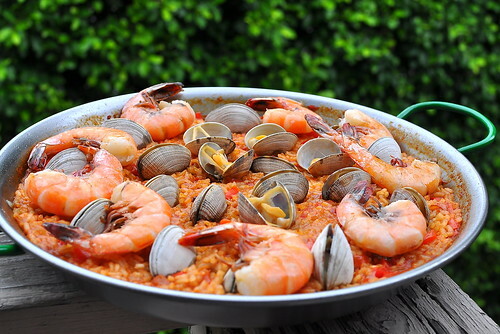 According to the recipe developers, there are six principles to achieving really fabulous paella. The ones I found most important were steeping the saffron at the very beginning and sautéing the seafood in hot oil to build a strong flavor base. “The key is to build flavors from the bottom of the pan up,” the editors emphasized. Paella pans are designed for this purpose, though a wide skillet of the same size will work, too. The seafood used in this recipe was provided by I Love Blue Sea, a web-based sustainable seafood company in San Francisco. The Gulf shrimp were caught using turtle-free nets, the squid came from the Northern California coast, and the clams were a combination of Littleneck and Manila. The original recipe called for monkfish, but I decided to eliminate it from the recipe after learning that it is overfished and caught using bottom trawling, which decimates the ocean floor. Try as I might to keep abreast on the dos and don’ts of sustainable seafood, I can’t always remember everything I read. I was thankful to have a trusty consultant in I Love Blue Sea to point me in the most eco-friendly direction. My homemade Fisherman’s Paella turned out as pretty and tasty as I had hoped. The rice was cooked perfectly al dente, while the seafood was sublime. Best of all, I was able to achieve the subtle flavors that made the paella in Valencia so special. 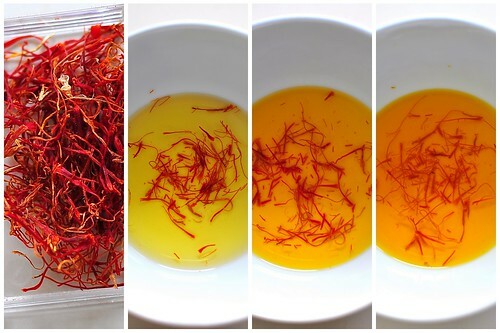 I have just enough rice and saffron to prepare the recipe two more times. I will have to space out the occasions carefully to fill the interval until my next visit to Spain. Heat oil in a 16″–18″ paella pan over medium-high heat. 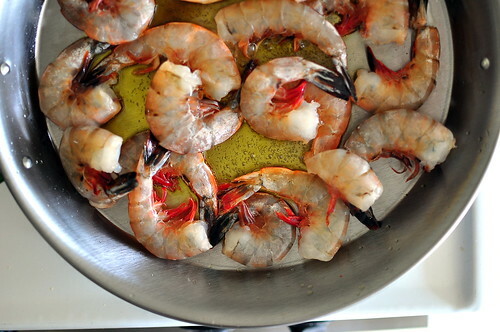 Add shrimp, lightly salt, and cook, turning occasionally, until golden brown, about 5 minutes; transfer to a plate and set aside. 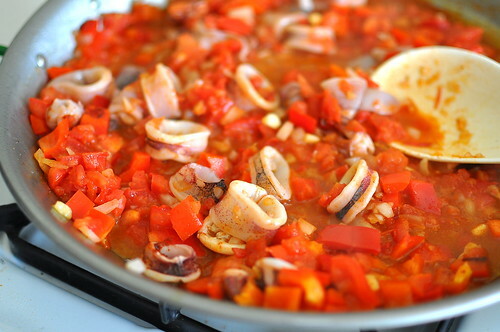 Add cuttlefish, paprika, tomatoes, garlic, peppers, and onions to pan and cook, stirring often, until onions are soft, about 6 minutes. Add reserved saffron mixture and broth, season with salt, and bring to a boil over high heat. Reduce heat to low, add reserved shrimp, and nestle in clams hinge side down; cook, without stirring, until clams have opened and rice has absorbed the liquid and is al dente, 5–10 minutes. Remove pan from heat, cover with aluminum foil, and let sit for 5 minutes before serving. this was delicious!!!!!!!!!!! was starting to wonder if you were having too much fun in FL to blog!! My friends and I were just talking about making paella tonight. I don’t make it often enough. You did a beautiful job on yours–your pictures are stunning! it looks amazing and authentic! I’m glad to hear that you’re conscious about seafood you eat. I just saw a documentary on this subject. Very interesting and alarming at the same time… I should do the same. Wow! Im going to have to try and make this for Phil one day. This looks really delicious!! The prawns…my favourite..are so big! I have only tried paella at the International Market here. Would have to learn to cook myself. Thanks very much for sharing. 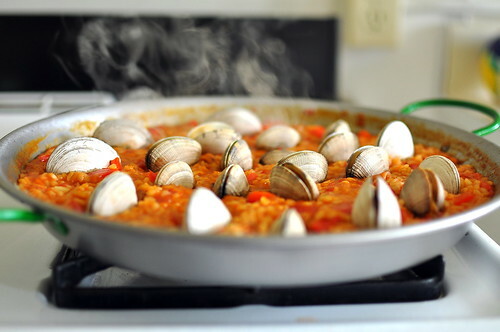 I like that pic with the steaming paella pan. thin depth of focus worked to good effect. thanks for writing up this recipe, love to use it some time. ack! what are you doing to me. now i want to make some!!! wow that looks really good. 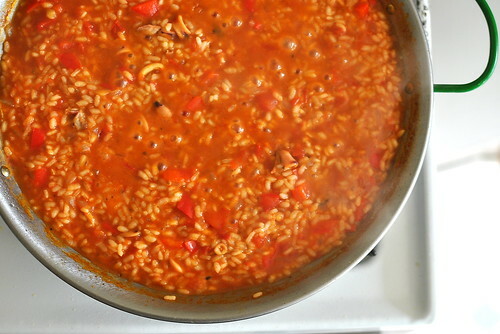 i love paella, but must be the slave to someone else’s cooking to get a taste. i tried making it once and it turned out soupy. bleh. Oh my GOD that looks good. I’m going to have to try this! Haven’t found anything to satisfy my craving since coming back from Spain FOUR years ago. Thanks! I can’t believe I missed reading this post until now. 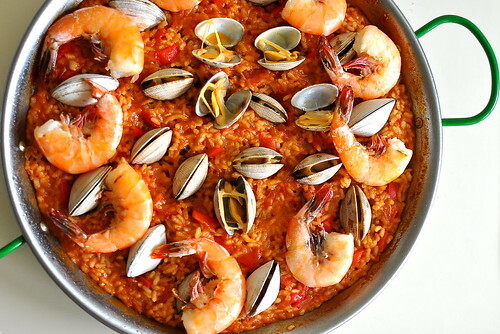 I love paella but never had the guts to make it…fearing i would disappoint myself. Now I’ll will give it a try! Pingback: Paella! | Irene en route.